I was hoping to be back with a new recipe at the tail end of last week but I’ve been laid low with what might be whooping cough (how Dickensian!! ), so I haven’t been cooking at all. 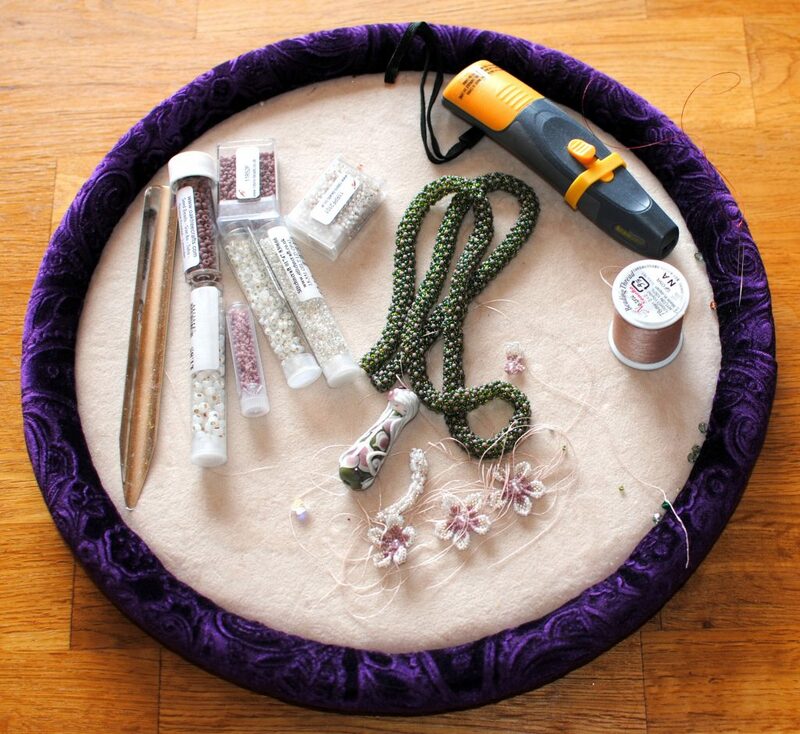 Instead, it’s time for a craft update. Can’t actually show you what’s on my desk as it’s basically a heap of crap which has nowhere else to go. Clearing it was one of my tasks for last week but have hardly moved from the sofa. Instead, I’ll show couple of projects I have on the go at the moment. 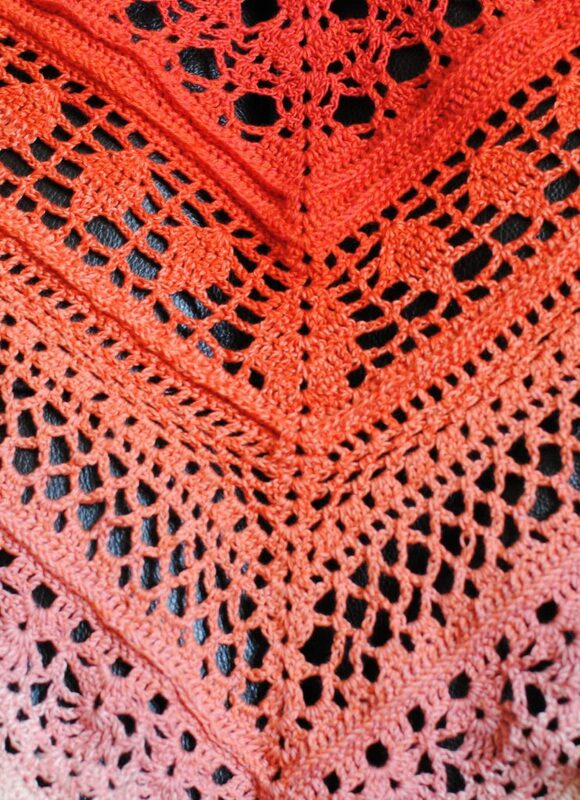 First up is this gorgeous baby blanket from A Year of Baby Afghans (Book 4) published by Leisure Arts. This one is for the month of March and is designed by Mary C Abadir. It’s the first pattern I’ve done from this book and I’m a little bit in love with it. In fact, I keep looking at the blanket as it’s so pretty. Once downside of the book is that a few diagrams would help for reassurance, but saying that, I’ve managed fine without them. I’m using Drops Baby Merino, which is a 4-ply yarn, in Powder, Light Turquoise, and Light Grey, with a 3.5mm hook. That yarn is thicker than some 4-plys I’ve used and the colours are gorgeous; I’m especially fond of the Powder which is a slight pink hint to it which, when mixed with other colours, gives a gorgeous soft neutral effect. 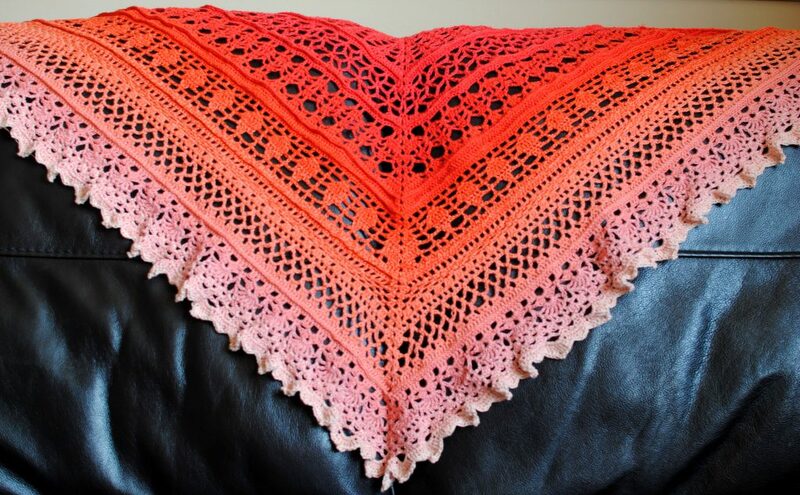 Another crochet project I’ve just completed (with the exception of sewing in 2 ends), is this Edlothia shawl by Jasmin Rasanen, available for free on Ravelry, worked in Sheepjes Whirl in Strawberries and Scream, with a 3.5mm hook. 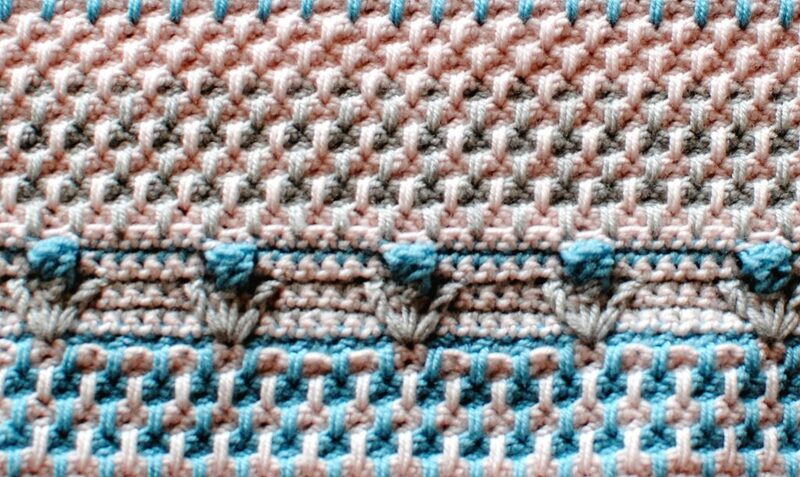 I am very pleased with the finished piece but the pattern was a bit challenging to understand, perhaps owing to some translation issues. 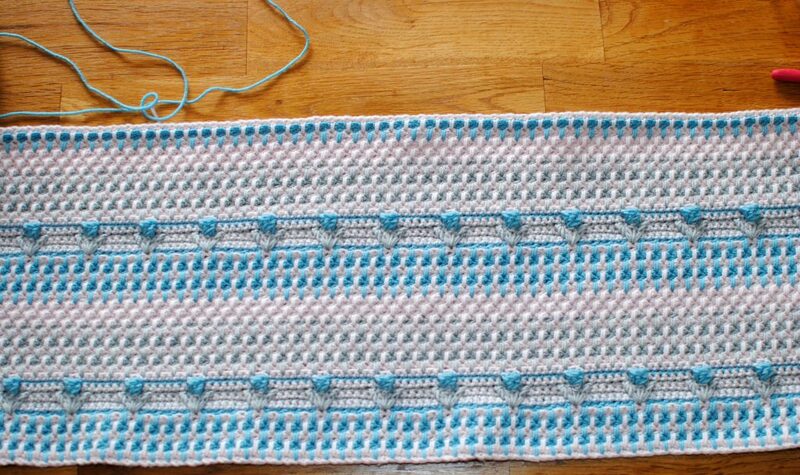 On a positive note, it really made me learn how to understand crochet charts! Finally I’m still toiling away at the necklace I’m doing, incorporating this beautiful Lost Girl bead by Soul Silver. I have been doing this in fits and starts for about a year and at the stage now where I’d really like to get it finished this week. 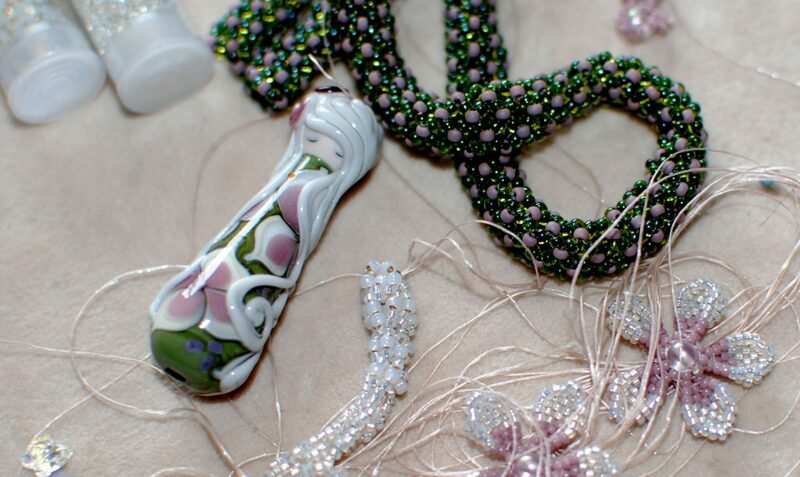 The flowers are from a pattern in Spellbound’s Floral Beaded Jewellery by Julie Ashford, and the rope design from Beautiful Beaded Ropes by Jill Wiseman. I’m also at the finishing stage of a silver and copper bangle, using some form folding, at Silversmithing classes, so will hopefully have it home to show soon. Thanks for looking. Hope to see you again soon..and I promise I’ll have a new recipe soon.